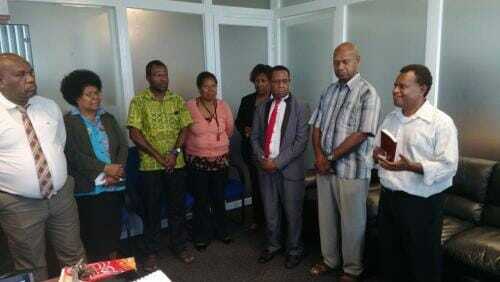 Koney Samuel, an associate senior church elder at Gordons Seventh-day Adventist Church in Port Moresby, Papua New Guinea (PNG), has been appointed by the PNG government as acting secretary for the Department of National Planning and Monitoring. Before his appointment as secretary, Samuel completed his master’s degree in public administration and is currently the longest-serving officer in the planning department. A native of the Roma village in Maprik, East Sepik, Samuel, along with his wife, Nancy, and their three daughters, has been active in building the village’s local church, pastor’s house, and other projects, as well as efforts in Gordons, where they now reside. Before taking his new seat, Samuel invited Central Papua Conference secretary Rex Koi, stewardship director Fred Malawae, Gordons Seventh-day Adventist Church pastor Wali Kapi, and ADRA planning director Darren Yori to lead out in a special dedication service for his office. Also present was Sepik Mission secretary Martin Sungu, who flew in from Wewak. Reading from the book Pastoral Ministry by Ellen White, Sungu reminded Samuel and his staff of the importance of “not building walls” to separate them, as believers, from a dying world. The position of planning department secretary is one of the most sought-after jobs in public service in Papua New Guinea, as it is the department mandated to prepare the national budget and allocation of foreign aid to key development projects. Hence, Sungu said, it calls for an attitude of utter dependence on God Almighty for His wisdom and strength to perform one’s duty. Pastors and leaders attending the special service led in a session of dedicatory prayers over Samuel and his staff before he took his seat in his appointed office. Samuel thanked church leaders for the time together and asked them to continue praying for every member of the government.